It’s A Piece of Pasta ???? ???????? When cooking pasta some simple rules will produce perfect results every time. The biggest problem people have when cooking pasta is that it sticks…So they are tempted to add oil of all things?? Why would this work??? Oil is clearly lighter than water and so settles on the surface and has no effect on the pasta what so ever. So if you want to stop your pasta from sticking you need four things. First you need the biggest pan you have with rapid boiling salty water (see guide below). A bigger pan of water creates more bubbles, these combined with salt is what stops the pasta sticking, along with a regular stir with a wooden spoon. We use wooden spoons as they are softer on the pasta. 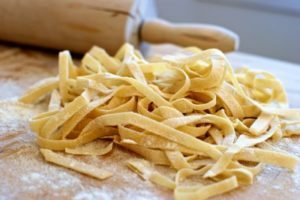 The “Always” & “No Need” Top Tips For Perfect Pasta! Always make sure your water is boiling with lots of bubbles before you start cooking. No need for a lid on the pan when you cook. Always make sure you have plenty of water – typically 1 litre to ever 100g of pasta. No need for oil in your water. Always use salt in your water – typically two heaped tablespoons for every 5 litres of water. No need to cook your fresh pasta as long as dried – typically fresh cooks in 3-4 minutes vs dried 7-8 minutes.